Learning Hindi mangal font typing is very easy. Lets see how to learn mangal Hindi typing easily and where to download mangal font. Soni Hindi Typing Master is one of the well known software for Hindi Typing. Mangal font is the mostly used in government typing exams and government offices. Keep reading this post and you will know all the information regarding the font installation and available typing tools. Mangal is a Unicode Hindi font. Hindi is written in Devanagari script hence mangal is also a Devanagari script font. Mangal font can be displayed across all the device and platforms consistently. All the latest computers and smartphones have support for mangal font. You don’t have to separately download and install mangal font. There are many other Unicode fonts which are also quite popular – Lohit Devanagari, Utsaah , Aparajita etc. If you are using Windows 7/8/8.1/10 then you need not to download and install mangal font because Windows operating system has mangal font pre-installed. Even if mangal font is already installed in your PC or laptop but still you can not type Hindi because we have a keyboard which has only English alphabets. So do we need to purchase a Hindi keyboard for mangal typing? No. We just have to download and install a Hindi typing software in our PC/laptop. This is the same way we type Hindi in our smartphones. You can download and install mangal if you are using Windows XP. Download mangal font from the following link. How to type Hindi in PC with mangal font? The keyboard we use is not for Hindi typing. We have to use the available English typing for Hindi typing as well. For this reason we need help of some other software in this task. There are three methods available for Hindi typing and all are absolutely free. Google Input Tool : Google Input tool is a free software from Google. It supports all major Indian languages including Hindi. This is a transliteration software it means you have to type in English the software will automatically convert in into Hindi. There is no need to learn Hindi typing at all. If you are working in any office and want to type Hindi only occasionally then it is the most easy solution for you.Many people use this tool who do not know Hindi typing. Indic Input 3 : Microsoft developed this tool. It is also available for all Indian languages. It is not that easy as Google input tool. You have to learn Hindi typing with the help of a Hindi typing tutor. 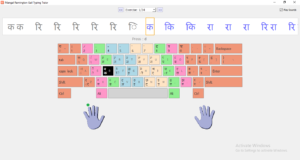 Indic Input 3 works with three keyboard layouts. Keyboard layouts are just three ways to type Hindi. Many government departments use this tool. Mostly candidates appearing in many typing exams learn this typing tool for their typing tests. Inscript: This is already installed in your operating system Windows 7 and higher version. You have to just activate this from the control panel. Inscript typing is the most tough and time consuming to learn. Like Indic Input 3 tool this typing is also used by a few government departments so candidates preparing for government job typing examinations usually learn inscript typing also. 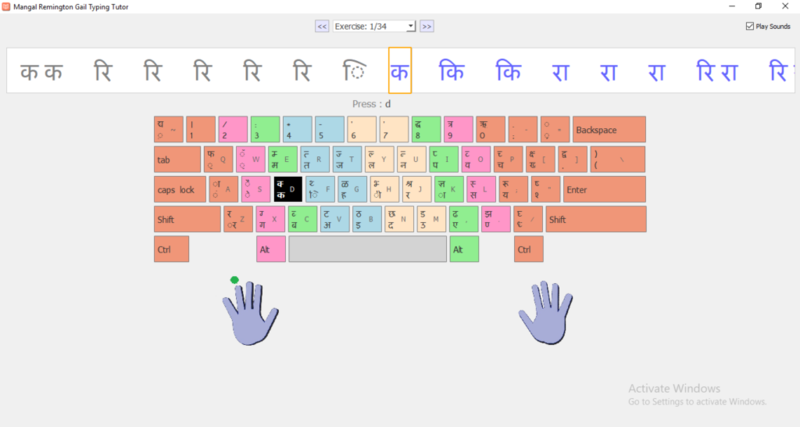 Which Hindi typing keyboard layout should I choose? Depends of your need there may be many situations. We have tried to answer for some common possible scenarios. First, If you just want to type Hindi for your office work or personal work and you are not going to appear in government job typing exam then you should choose Google Input Tool. Second, If you are preparing for a government job typing exam then you have to read your recruitment notification carefully and check what keyboard layout will be used in the typing exam. Most typing exams give you a choice to choose any of the keyboard layout among Remington Gail, CBI, Inscript etc. You can choose any any keyboard layout according to your convenience. If you have choice then we recommend you to choose Remington Gail keyboard layout because it is easy to learn and get fast typing speed quickly. Third, If you have to appear in such an examination where there is no choice then you can not do anything at all. You have to go with the option provided by the recruiting department/board. Hindi Typing Tutor to learn mangal font typing? If you want to learn mangal font typing with any keyboard layout be it Remington Gail/CBI/Inscript you can download and install only one software- Soni Typing Tutor. Soni Typing Tutor is the most widely used Hindi Typing Software in India for years. Soni Typing Tutor supports all the keyboard layouts and all the typing exam patterns held in India so far. Download Soni Typing Tutor from the following link. For any queries ask us in comments.